I watched The Truth About Looking Good with Cherry Healey tonight over on BBC iPlayer after Nomipalony recommended it on her insta stories. You can watch it online until 9 February here or search for it on your TV. There were several different sections to the hour-long show where they investigated various aspects of the beauty world including how we are seduced by packaging and 'science' and how we should be buying cheaper foundation and lipgloss and splurging on mascara (personally - I don't like cheap foundation but I guess that's just me) but the part that really captured my interest was the skincare section. This year, I invested in what I'd call 'proper' make-up and skincare. I love, love, love Elemis products and definitely prefer luxe brands to their cheaper counterparts. I think I'm the only woman on earth who has a reaction to Aldi's skincare range and just can't get away with it! The programme kind of touches on how luxe brands help to make us feel bad about ourselves so we spend a bit more but that's a whole other blog post. I was interested in the testing. They tested a variety of moisturisers from budget to blow-the-budget and in terms of anti-ageing found that none of them worked and their conclusion was pretty much that healthy skin does not need any kind of moisturiser. Interesting stuff eh? In all of their testing, the biggest effect of ageing was the sun. They pretty much said if you can do one thing to combat fine lines and wrinkles, you should wear sunscreen on your face every single day. They showed a couple of what I'd call 'normal' women their skin and fine lines using specialist equipment and the damage you could see from the sun was really shocking. I kind of know that I should be wearing sunscreen every day already but in my head, I'm all about the luxury moisturiser when REALLY I should be all about the sunscreen. My Bare Minerals Complexion Rescue does contain sunscreen but I don't wear this every day. The Truth About Looking Good has really made me think about using preventative measures and I'm definitely going to invest in a proper face sunscreen next week - let me know if you have any recommendations. The second product that really made a difference (and the before and after photos really were WOW) was Retinol. Now I've kind of heard of using retinol before and know you can buy it pretty cheaply from The Ordinary so I'm going to give this a try too. It needs to be used with caution and the show recommended starting with a bottle of 0.1% retinol before moving up to 0.3% then 0.5% and then finally when your tolerance is ready, using a product that is 1% retinol. Does anyone use any retinol treatments at the moment? I'd be interested to hear your thoughts. I know that society has conditioned us to feel like this (and it's kind of the opposite to what the show was trying to say) but I love the look and feel of soft, smooth skin and feel better about myself when my skin feels good. I really want to try using retinol myself after seeing the results. The final revelation focussed on anti-cellulite treatments. I'll be honest when I say that I'm not bothered by cellulite one little bit, it's just part of me and I am 100% happy with it. In the show's tests, they discovered that the absolute best thing you can do for cellulite is dry body brushing. On average, cellulite reduced by 24% and one lady in particular had significant results. Personally, I think life's too short for body brushing but it was interesting to see that this was far more effective than the multiple lotions and potions that are marketed to us. 1 - Can you recommend a daily sunscreen for my face? 2 - Have you used Retinol products and what are your experiences? I use Triple Oxygen Ultimate Protection UV Moisturiser by Bliss which smells lovely and fresh. It absorbs quickly. It's a broad spectrum sunscreen with SPF 33. It’s a yes on the retinol, The Ordinary stuff is amazing, also vitamin c on your skin when you are going to be in the sunshine. I wear an spf every day but I probably started a good skincare regime in my mid 30’s, if I hadn’t ever smoked and I’d done that I might look much younger! I use This Works In Transit each day which had SPF30, UVA filters and hylaronic acid. It’s a lovely moisturiser and not at all thick or chalky. It’s £29 per tube but I always look out for a 20% discount which is often available online. They don’t have a UVA rating on it though. In terms of retinol, I’ve used the La Roche Posay Redermic which is 0.3% retinol. 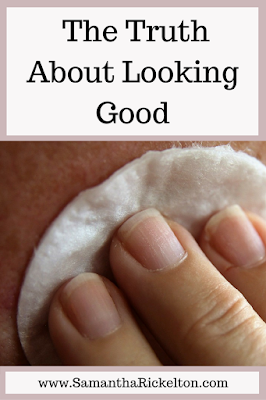 It goes on really well under any skincare and I’ve not had any problems with irritation. It’s around £30 but again, always on offer (Boots). I’m tempted to give The Ordinary retinol products a try as well. Good luck, look forward to hearing about what you try! This show sounds so interesting, going to add it to my Sky planner. I use Liz Earle and Clarins on my skin and definitely notice a difference. I switched to a cheaper brand when I was short on money last month and my skin felt awful! My only concern with using sunscreen every day is the loss of vitamin D, did they talk about that at all?